It’s the fourth day of the 2018 High Fives series and the contributions from songwriters and performers are starting to come in. it’s always good to have something from Graeme Wheatley, bass player and songwriter with Deep Blue Sea and all-round nice guy. It’s great to see that Graeme has completely embraced the High Five brief – just five of absolutely anything. And there’s even some Shakespeare for you as well. All photos courtesy of Laurence Harvey. What subject can I pick? Allan will have the gigs sewn up for sure. I think I did albums and musicians before. I guess my answer is easy – it’s what I am doing right at this very moment. Or rather, it’s what I should be doing – but I am letting Allan’s request for an article distract me. Song writing. I first thought I’d write a note about my favourite 5 songwriters – but none of them have written anything new this year – and it’s 2 years since Leonard decided to write no more. So I thought I’d write a little about some Deep Blue Sea songs – it might be self indulgent, it might be a bit arsey? But surely it’s not as bad as scoffing an entire tin of Quality Street tho of course, I might do that too. 2018 has been a year of writing songs. Deep Blue Sea started to write as a unit when Dre and Amanda joined Iago and me in March 2018. In the space of 3 months we got together, did a few gigs and then recorded a live album featuring 5 songs that were written in that 3 month creative burst. Since then we’ve probably written about 15 more and we’re in the studio over December and January recording them for a new album in 2019. So, Iago had this little Stonesy type riff- except as always with Iago – the chords were weird, wired and inspired. I’d been to an art exhibition in Dulwich and there had been a painting I really liked. Couldn’t afford it of course, but there were some postcards of the painting free – so I took a couple. Got home later that day and looked at the picture. Surreal dreamscape with horses. Turned it over and the title was “All I ever wanted was Rock Star Status”. I knew I had a title. The lyrics flew onto the page – it was a job stopping them. When Dre started working on the melody she noticed nothing really rhymed very well. There’s the language barrier for you. You say Status and I say Status!!! We compromised. What’s it all about? You tell me. I’ve been wondering. 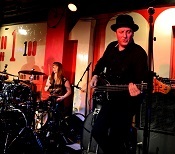 Oh, by the way, the artist, Kate Pritchard, who painted the picture, came to see the band at our gig last week at 100 Club!!! Circle complete. That was a total new experience for us both – and a really good one. Life eh? I got to thinking about a friend of mine who I am very happy to say is on the other side of the tunnel from her period as a manic pixie, but there was a time when several friends and I worried about this frail and beautiful butterfly. We saw her floating, we saw her shine and shimmer but we couldn’t do much to shelter her from the storms inside. She was fighting battles we had no weapons. I wanted to try and capture the idea of a moment in time with her – where words don’t always mean what they appear to mean, where things tail spin off into other moments – the uncertainty at the core of a person in turbulence. I’m so glad she’s still my friend. And in the weirdest ways the manic pixie dream days are not over but no longer laced with the threat of a long, long night. See the falling tide – what’s left behind? This song grew in the playing. Iago’s guitar solo can take us off anywhere. When Amanda got into the song and the feel of it – she started to push things and take risks. If you listen to the live album, there’s a few moments where we could all really fall on our collective bums as we get perilously close to the edge. I think that’s the one of the great things I love about playing in the band – we are a band. And I think we all love the risks. Nobody stays calm – we’re all in it together. Dre’s melody to the chorus transformed this song. It would not have been on the album if she hadn’t have lifted something special out of the void. I co-wrote the lyric with Emma Holman. 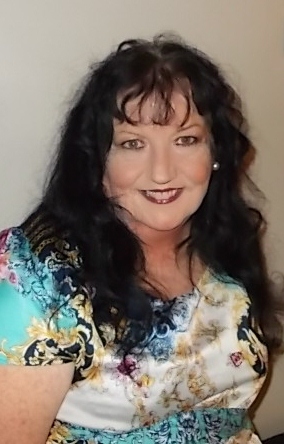 I think she put some truly heartfelt emotion into the words and thank her for sharing. you’ve taken the wrong turn round every bend and twist. Lyrically, for me, it’s a dark night of the soul song. Make of it what you will. Sara (our previous drummer – from The Pearl Harts) liked this one a lot – said it reminded her of Muse. The line “This is the point of no return” was meant to have two meanings – but I realise one meaning is far more obvious than the other and unless I add an explanatory note, no one will see it. And who would be so tedious as to add an explanatory note? Duh!!! This wee tale started life as a song I was writing with the ace guitarist Chris Walker while Chris helped keep the band afloat for a year or so, for which I am eternally grateful. It wasn’t easy keeping things going – but we had commitments to honour and he’s a great guy. We also had a dear friend Louise Davies making sure we kept the flame alight – she didn’t give either of us any other option. I nicked my own lyric to drop into Iago’s infectious confection of rockabilly roll. A song called All Our Yesterdays with a rock and roll groove seems to be made for each other and it’s kind of as close as we get to a bit of light relief. This is Dre’s favourite dancing song – which is great for her – cos she can dance – but the other two people standing on stage beside her both have 2 left feet!! We try not to fall over. That is the lesson for today folks. Dance, laugh, be happy, it could be so much worse. Keep your head in the clouds and your feet on the floor and…..try not to fall over. 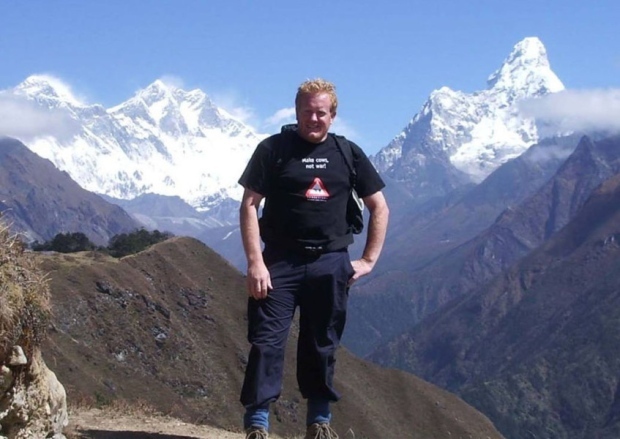 It’s always good to shoot the breeze with Graeme Wheatley from Little Devils and it’s great that he wants to share some of the highlights from 2015 with us. 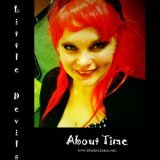 It’s been a chequered year for Graeme and Little Devils with a superb album to get behind and some recently-announced personnel changes; the Riot Squad are looking forward to the 2016 line-up. Graeme makes an unnecessary apology towards the end of this piece; whoever we are and however we do it, we’re all trying to promote music we love and there’s a place for all of us. So, let’s get on with it and hear what Graeme has to say. Well, the time is upon us – the end of the year draws close and it’s been a topsy-turvy world for Little Devils – so if I may take this offer of writing a “High Fives” article – I will draw a veil over the low fives – and stay positive and mention 5 good things that happened this year. 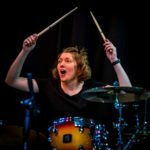 We had many great gigs this year – really enjoyed Doncaster Blues, Norwich Blues, Maryport, Colne and lots more festivals and lots of gigs – but if I had to pick out one gig, it would have to be Dock Rock in Hartlepool. This festival is organised annually to celebrate the life of a good friend of mine. Peter “Dock” Oliver. It’s organised by his wife and one of his close friends and it’s been my privilege to play there the last two years. It keeps Peter in my mind and gives me a chance to meet many mutual friends, play for them, chat and remember our friend. So, my heartfelt thanks to Gillian and Neil for giving me this chance. 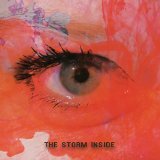 We recorded “The Storm Inside”, pressed it, released it and toured to promote it all within the first 5 months of 2015. It was amazing to see it reach No 1 in the IBBA play lists for May and to stay there for June! We were knocked out at the reception. We put heart and soul into the music. Belief in what we were aiming at, commitment into getting it as good as we could make it. The art work was our concept, every word and very note was sung and played knowing we were doing the best we could, the mixing, the mastering, the tea making and the mixing of the G&Ts – we did it all – especially the G&T bit. I dunno where she came from! Back in January Louise Davies didn’t exist. Simple as that. There wasn’t a person called Louise Davies in our world. Then I met Bill Mead of The Sharpees. Bill can talk for England, and in one of his monologues about what I needed to do to move the band forward he mentioned this person he knew who could maybe help a bit if she liked the music (and if I somehow passed her “human qualities” assessment). A tentative “friend request” was extended. Then the storm broke – and it was a hurricane. How such a small person can generate so much activity I dunno. Whirling dervish springs to mind. Within maybe two months Louise was championing the band, playing our back catalogue on her radio show on Radio Seagull, promoting us at our gigs, speaking to agents around the world, telling everyone we were actually better than sliced bread – not just the best thing since – and in every other way – looking after us. We were honoured she accepted when we asked her if she would manage us. Since then, I have been given my instructions on a daily basis, I am kept in check, advised, encouraged, praised and slapped in equal measure! Louise is another pintsized powerhouse – I seem to be drawn to them! This, for Little Devils, has more than anything else, been the year of Louise!!! We are eternally grateful for the support, belief, advice, efforts and tireless bloody-minded hard work she has put in – long may you run. Now this is a bit cheeky, praising a music magazine in a music blog! But, come on. We are all grown-ups and it’s a wide world. I just wanted to say a big thank you to Alan Pearce for having a lot of faith in Little Devils. He signed us to Kross Border Rekords, promoted the band, booked us at Colne and Skeggie and on a regular basis, calls me up and chews the fat. The guy is dealing with health issues, but through all of that stuff, he keeps his enthusiasm for music burning bright. He’s juggling a stack of different things that would tire a fully fit person – but he’s battling on with determination, energy and commitment. And I just want to take my hat off and say well done Alan. We are Spartacus. 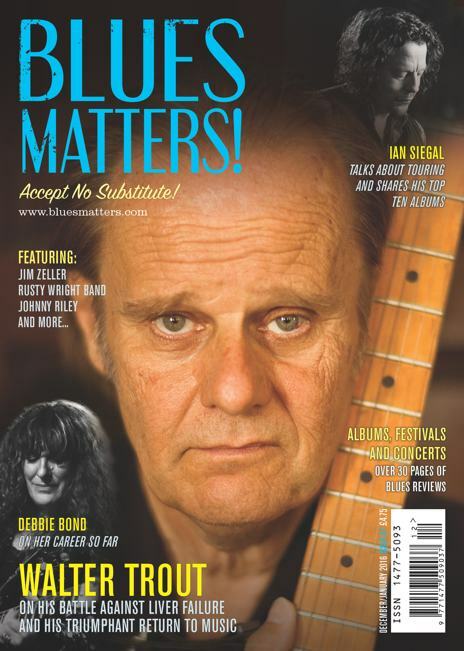 (And of course, there’s a load of space for Blues In Britain, The Blues Magazine, Music Riot, Blues in the South, BluesDoodles and all the other believers and dedicated enthusiasts of music – we are all in the same boat – let’s get rockin’). I am not going to say anything about the hard times we’ve had. This is high fives – and so – even tho’ this is kinda a review of 2015, I am going to have a sneak peak towards 2016. Last night, the new line up had our first rehearsal. Now, I dunno how people are gonna react. 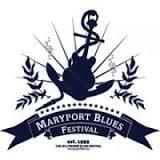 We are going to walk out on stage next week and introduce Mags Supel on vocals and Chris Walker on guitars with the usual suspects, the Pintsized Powerhouse, Sara Leigh Shaw on drums and what’s his name on bass. Mags has a thousand and one lyrics to learn, melodies, arrangements, dance steps, choreography and conjuring tricks (no – obviously not – but it must feel like that!) and Chris has 11 notes to learn – all of which, he assures me, he’s played before. At least once. It is a daunting task. Frightening. But listening to Chris play last night, I smiled. Listening to Mags getting her head around the vocal and then adding her own touches, I nodded. Yes, it’s going to be good. It’s going to be great. So, out of the ashes, in December 2015 into the brave new year, Little Devils rise. Having new people come in, full of enthusiasm and commitment is, in itself, energising. Two days ago, for the first time in maybe 4 months, I had to jump out of bed, grab a guitar and quickly get down a new song that had just been delivered to my head via wherever. This is how it starts…. Ok, some life lessons for music lovers from tonight. First, if you get a chance to go and see a band (even on a school night), do it, because life’s too short. Second, when a mate recommends a band, go and see them. Third, the escalator at Angel station is the longest on London Underground and I’m not getting any younger; running up any escalator is for the young and fit, as I discovered. So, pulling all of this together, my mate Paul in Middlesbrough (closely followed by Graeme Wheatley from The Little Devils) told me I should have a look at The Jar Family, who were playing at The Islington. The Jar Family is another example of a group of people who have realised that the music business as we knew it doesn’t exist now. A bunch of players and songwriters from the Hartlepool area decided that the best way to get their songs heard was to work together as one unit drawing on the creative input of all the members. After a lot of hard work and personal sacrifice, they’ve come up with something really special which Teesside has known about for a while and the rest of the country is just beginning to catch up with. The band members are: Max Bianco (vocals, guitar, harmonica, percussion), Dali (vocals, guitar, slide guitar, percussion), Richie Docherty (vocals, guitar, percussion), Chris Hooks (vocals, lead guitar), Keith Wilkinson (bass, vocals) and Kez Edwards (drums). If that sounds like a lot going on, it’s even busier when you put them on a stage, with the look of a Victorian street gang infiltrated by Tim Burgess. There’s a lot of movement between songs as the three singers take turns centre stage and guitars are swapped around, but it’s smooth and professional in a way that reflects the amount of work they’ve put in over the last few years. The set opens with the latest single “In the Clouds” and rattles through a mainly uptempo set including “World’s Too Fast”, “Machine”, “In For a Penny”, “Footsteps”, “Paint Me a Picture”, “She Was Crying”, “Moya Moya” and “Tell me Baby” before a two-song encore of “Debt” and the appropriate closing stomper “Have to Go”. There are plenty of committed fans in the audience who have made the journey down from the North-East but by the end of the set, the rest have been won over as well by a combination of a varied bunch of songs delivered in ever-changing instrumental settings by a very tight and solid group of musicians, but that still doesn’t tell the full story of The Jar Family’s appeal and why they’ve built up such a fanatical following so far. There are a couple of things that single this band out from the crowd. The band members interact with their audience on and off stage in a way that creates a shared experience; this isn’t about us and them, it’s about everyone together. The other thing is the songs; they’re accessible (whether they’re raucous or quietly melodic) and the lyrics deal with themes that most of us can relate to our daily lives. When you put a group of people like us on stage singing songs that could be about us, it’s a difficult combination to resist, particularly when the vocal and instrumental performances are so good. I understand what all the fuss is about now.